The Ottawa 67’s will celebrate the most recent decade in the club’s 50-year history on Saturday with a bit more spring in their step. 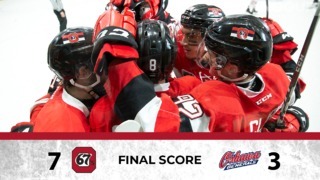 With back-to-back wins last weekend, the 67’s will honour the 2007-2017 era of the Barber Poles with a matinee clash against the Oshawa Generals on Saturday. That will be followed by another afternoon game against the Owen Sound Attack. 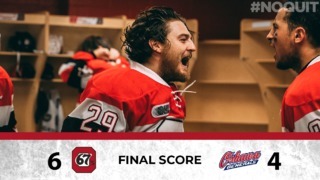 With just three points separating the seventh-place 67’s and the fifth-place Generals, the 67’s are getting hot at the right time and know four points this weekend will go a long way to solidifying their playoff hopes. Like Ottawa, the Generals are also coming off two consecutive wins, scoring 14 goals in those two contests. The previous meeting between these two clubs resulted in an overtime win for the Generals. 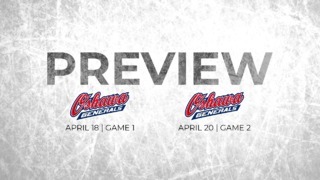 This will be the eighth time that these two teams are facing each other this season with the Generals having won four out of those, including the last three. They are currently fifth in the Eastern Conference but just three points above the 67’s. With just one loss in their previous eight games, Owen Sound is enjoying a good run. They have managed to turn their season around after a rough stretch at the end of 2017 that saw them win just one out of their 14 games. Recently, they have brought themselves back into playoff contention. This is the first time these two sides will be meeting this season. The last time these two teams clashed, it resulted in a 10-5 win for Owen Sound but 67’s have won three out of the last five encounters with the Attack. Sasha Chmelevski needs two goals to hit 50 as a member of the 67’s. The 18-year-old centre has been strong of late with 17 points in his last 10 games. Tye Felhaber has scored points in three consecutive games. Shaw Boomhower’s goal against the Niagara IceDogs was his first for the 67’s since joining the team from the Mississauga Steelheads. Mitchell Hoelscher has now scored in two consecutive games. Sunday’s game will also see former 67’s goaltender Olivier Lafreniere return to Ottawa for the first time since being traded to Owen Sound.